Availability: All year. Sporadic availability through Summer. Handling Tips: Keep cold. 35° F and dry. General Information: In France the Lady apple is known as pomme d'Api, or Api. In America we usually call it the Lady apple. According to Creighton Lee Calhoun, Jr., author of "Old Southern Apples," it is also known as Lady's Finger, and Wax apple. Of all the known apple varieties, the Lady apple is the oldest. Some sources say it dates from around the first century A.D., about two thousand years ago when an Etruscan developed it. These juicy apples are outstanding with a mildly sweet-tart flavor. They have white, crisp flesh. Lady apples are excellent for eating fresh as dessert and snacks. They're also used for cooked dishes, such as fruit sauces, and garnish. Other favorite uses include fruit and cheese trays and fruit baskets. Yet one of the most traditional uses for this fruit is for decorations, especially for Christmas. The small size makes them perfect for wreaths and similar items. That explains why it is also known as the Christmas apple. 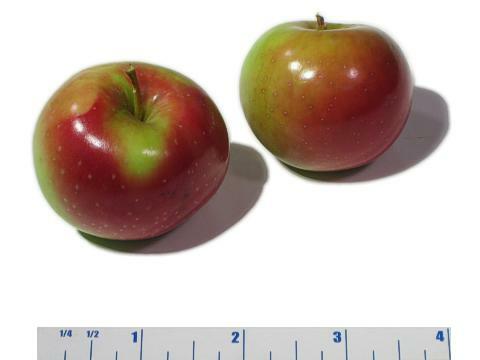 Applications: These juicy apples are outstanding with a mildly sweet-tart flavor. They have white, crisp flesh. Lady apples are excellent for eating fresh as dessert and snacks. They're also used for cooked dishes, such as fruit sauces, and garnish. Other favorite uses include fruit and cheese trays and fruit baskets. History: The Lady apple was first documented in 1628 during the French Renaissance. In France it was first grown in the garden of Louis XII. Later Louis XIV felt it was the only apple variety that was worth growing. The Lady apple was grown throughout Europe, and was later introduced to North America. It was of particular importance to European settlers in the Northwestern states. There it became a staple. During Colonial times people considered the Lady apple to be a special Christmas treat. This may have been because the apples ripen late in the season and store very well. William Coxe, the famous American fruit expert, grew these. His records indicate he had 31 trees of this variety in 1828. He sold barrels of the apples in Philadelphia. He started his orchard in 1794 on his farm on the Delaware River. In 1828 his inventory shows he had 89 varieties and over a thousand trees. Over the years so many people requested information from him about apples that he eventually published a book on the subject with his notes and observations on the varieties. It was illustrated with his life size drawings of the fruits. Apparently Lady apple became naturalized in America. Calhoun quotes a source from 1867 indicating this was the case. According to Calhoun, Lady apple was widely grown in the South. The fruits were exported from America to England after the Civil War where they brought a tremendous price. Henry David Thoreau also grew this variety.